High quality materials and "Made in Germany" quality for safety and durability. Cutting rollers made of hardened solid steel. Convenient material feeding via conveyor belt. 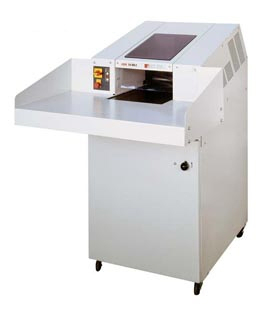 An automatic return eliminates paper jams. Effortless emptying via a removable trolley with a reusable collecting bag. User safety through emergency off switch. Functional operator control panel with LED indicator. Extension of the loading table by 600 mm; used for material storage (left or right).